We truly recommend that you’d better get the tickets 1-2 day prior to departure date at least, and don’t forget to bring your passport to the train station. If your schedule is too tight to get the tickets in advance, you must get the train tickets 2 hours in advance in case of emergency. Once our Tibet travel agency booked the train tickets, we will send you the ticketing reconfirmation codes with which you can get the tickets out from railway station ticketing hall. Meanwhile you will need to provide the Tibet permits photo copies when you ask for the train tickets, and when you travel on the train, the railway police may check your Tibet permits document. To buy Qinghai-Tibet train tickets, you need to email your valid passport photo copy to our Tibet travel agency and once the tickets are on sales (normally at least 30 to 60 days before train departure date), we will help you buy the train tickets. While to be able to get the paper tickets and board the train from mainland China to Tibet, you will need a valid physical passport, a Chinese visa and a Tibet Tourism Bureau (TTB) permit (original or photo copies). The original copy of TTB permit is needed when you board the train to Tibet from Chongqing, Xian and Lanzhou, however except for three cities, the printed photocopies of permits are fine for you to claim the train tickets and board the train from Beijing, Shanghai, Chengdu, Guangzhou, etc. Your Tibet TripAdvisor will reconfirm to you at least 5-10 days before your arrival date in Tibet. Please follow the link to learn more about Tibet Travel Permits Documents. Qinghai Tibet train tickets prices ranges from hard seats, hard sleeper to soft sleeper, 3 categories. And it depends on which city the train is from. Different starting station has different price. Once you send your confirmed Tibet tour schedule, we will help you arrange your train tickets. Yes, you can book your train tickets to and from Tibet (Lhasa), but you need to know that China train ticket is difficult to book for foreigners, especially during the peak period of June to August. And the train tickets to and from Lhasa start selling 30-60 days before the departure date. The train ticketing schedule situation keeps changing always. If your schedule is flexible, you can try to wait for the tickets when it is available. The train has a dining car with Chinese cuisines, instant noodles and some Tibetan dishes served. If you don’t want to eat there, a delivery cart which will serve dishes to every carriage may meet your requirements. The price will be a little expensive than usual. Each carriage has water boiler; you can get the boiled water for free with your own bottles. So drinking water or hot water supply on Tibet train is available and you never need to worry. More over you’d better prepare some easy energy food for the long time train travel. Experts declare that taking the train travel to Lhasa does not offer much help to against AMS (Altitude Mountain Sickness) because the train is special designed and pressurized to prevent altitude sickness toward passengers. Many Tibet tourists may have trouble sleeping on the train and feel exhausted after arrive in Lhasa, so normally we suggest our clients to spend at least 2 days in Lhasa before going to higher altitude attractions. Electric outlets are available in the corridors of each carriages, you can charge there, but what you need to keep in mind that sockets and plugs used in China are A, C, and I.
You’d better consider to prepare some snacks and easy food; bottles for boiled water; flash light (Train lights turns off at 22:00); eyeshade and earplugs, and personal washing staff such as soap, towel, tooth brush and toothpaste, slippers, shavers and so on. Can you Recommend Reputable Tibet Travel Agency in Lhasa with Better Prices? This is a very common questions about Tibet travel. When you search information on TripAdvisor or google, you will easily find lots of local Tibet travel websites. Many of them are not registered tour companies at all. And many of them got many nice reviews and recommendations on TripAdvisor. More over, the famous lonely planet Tibet travel guide books also favored and picked many local travel websites. All of This looks awesome, but be careful, every agency is competing and trying to improve Tibetan travel services from every aspect. I wish you do not only consider reputation but also find a nice offer. This should be the core. In this internet transparent world, do you still want to spend too much money for the same or very identical Tibet travel itinerary and service? If so, please make more and save more money for the “Sky High local Tibet tour prices” or “Sky High Overseas Tibet tour prices”. For more details, you are welcome to contact our local Tibet travel agency now. Time has changed! With the internet quick development around the world and people do not have to find agencies from the books and all those information is very out of date. For Example, Tibet Ctrip Travel Service (www.tibetctrip.com) were highly recommended on Lonely planet guide books around 8 years ago but in their 2014 or 2015 edition, they gave our site a miss. Because of these guide books recommendation, many local Tibet travel agencies sell sky high prices to the overseas travelers. This is not bad if you are really that rich to do a easy or the same tour with more than double price. Even like tripAdvisor, they are never focused on charity anymore but on business. We suggest overseas travelers try best to select a Tibet travel agency which can sell fairly lower prices with quality services. After reading this, you should know that in the past, many foreign travelers paid sky high prices for Tibet tours because of lack of information resources. Nowadays people can travel in Lhasa with maximum flexibility on their own and you do not have to book each and every services from travel agencies. Many foreign travelers often tell us that: some travel agencies say the Tibet travel permit is totally free. Well as local Tibet travel agency, we want to tell you that, this is their promotional words and it is not free at all. This is a tourist trap and they do not offer your permits only services. They must sell you something before they can apply Tibet travel permits. And few other agencies may tell you that the permit service fee is around RMB 1500-2000, this is sky high price and this is not true as well. So for Tibet permits only, there are lots of rumors. 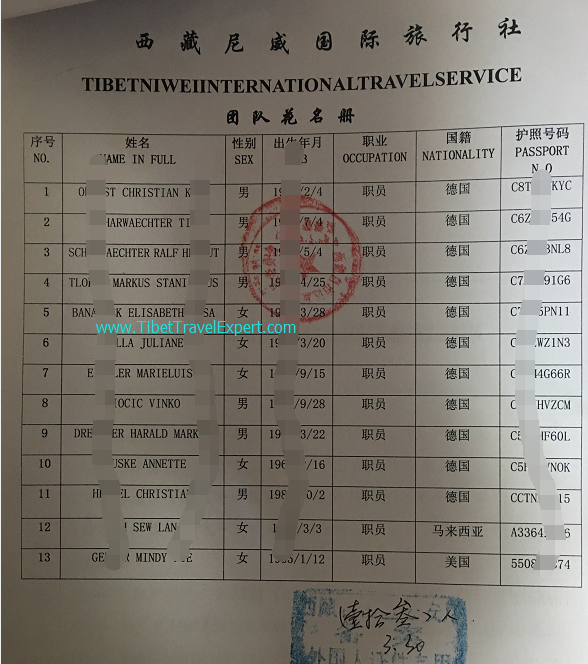 Here lets state it clear that travel agency in Tibet must prepare lots of work to apply Tibet travel permits according to the permits schedule. If your trip is with Everest base camp, you d better confirm a tour booking at least 15 days before arrival date, and if your trip covers Mt. Kailash, it is safer to confirm a tour booking at least 30 days before arrival date. For easy cultural tour in and around Lhasa, you can even apply permits 10 days in advance only. Here below we will share how to get the Tibet travel permits. confirm a full tour or minimum tour service with local Tibet travel agency per above time schedule. It is better to confirm earlier to avoid urgent situation. Once local Tibet travel agency gets your passport copy and/or China visa photo copies, they can prepare to apply permits 1 month-45 days at most. Permits will be ready at least 1 weeks before your arrival date in Lhasa, as experienced Tibet travel agency, we get permits almost 20 days in advance. One permits got from Lhasa, agency can send permits to your address in China, and it is not wise to send permits abroad. as the international express from Lhasa is too complicated and too risky. Then at least 2-3 days before your arrival date, you can get the Tibet travel permits and fly to Lhasa without any problem. Tony authored this article and any further details, you are welcome to contact our local Tibet travel agency now. Below are common questions and answers from local Tibet travel agency regarding how to travel from Bhutan or India to Tibet. 1) Do you have to get a tour service for Lhasa? Answer: For Lhasa or Tibet tour, you can book minimum tour service such as Tibet permits/visa, day tour guide, and you can book all the other things by yourself. Normally people post here just to show their business or website with screen name and you’d better do more research on your own. 2) How do you travel from Bhutan to Lhasa, since I hear the border is closed between Bhutan and China? I’ve read that you must go from Paro to either Kathmandu or Delhi and from there you can take a connecting flight to Lhasa. Answer: The best way is to go via Kathmandu, Nepal. There is flight between Paro and KTM. It is not possible right now via Delhi. 3) Are there issues with Americans traveling to Lhasa? Are there issues traveling from Bhutan to Lhasa? Answer: Absolutely “No” right now. Tibet welcome USA travelers, no matter which city you fly from to Lhasa, it is fine, just be sure you have necessary Tibet travel permits documents. 4) How long does it need to travel in Tibet? Answer: Tibet is huge land and people normally choose 3-4 days to 2 weeks to cover most highlights of Lhasa, Tibet. Hope information above helps little bit. For more information about Tibet tour, you are welcome to submit one inquiry here. Foreign Tibet travelers frequently asked that whether they can fly to Kathmandu without a tour guide accompany and permits at Lhasa airport. The answer to this question is that: You will have Immigration problem if without providing “Tibet Travel Permit”. As you know, all foreign travelers flying from Lhasa to Tibet after Tibet travel, they need to provide passports, China visa, Tibet permits (including entry permit and border defense permit). 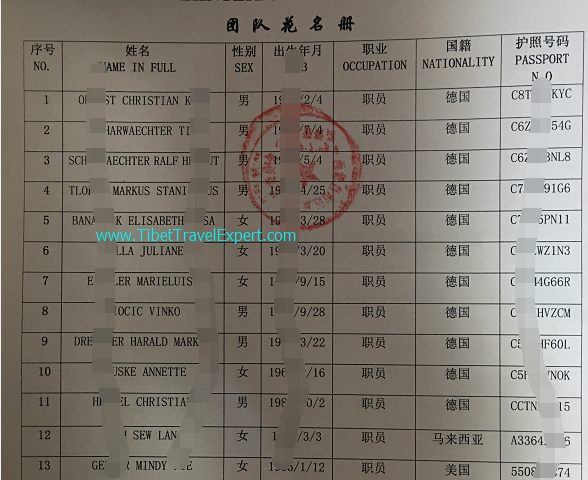 The airport custom authority will check all these Tibet travel permits documents, however your Tibetan tour guide will help you show all these Tibet permits. This is a common question about Tibet travel permits and Tibet visa. Well, you need a Tibet Group Visa. However, you cannot apply this by yourself. We will send an electronic copy of visa invitation letter to our local travel agency in Kathmandu and they will apply this for you. There is no need to apply for an individual China Visa in your country if you decide to travel to Tibet from Nepal because the Chinese Embassy will cancel your China Visa when you receive your Tibet Group Visa. How long can my Tibet travel permits be valid? and can I have the permits valid as long as I wish? The answer is “YES”. As a well-experienced and responsible Tibet travel agency, we can guarantee that during the time of your schedule with us your TTB Permit will be valid. If you want to change your schedule, please let us know in advance. We need time and extra efforts to rearrange your tour. If you arrive Tibet earlier than your scheduled date, this will be an urgent situation and we will charge extra service fee to reapply for your TTB permit. If you arrive later than your scheduled date, we can extend your trip for a few more days (normally 2-5 days) to help you finish the scheduled trip. Normally our Tibet travel agency can obtain the Tibet TTB travel permit 10-30 days before the starting date of the trip. If you book the trip earlier, we can get the permit earlier. However one month in advance is the earliest we can. If you are going to fly into Tibet from any airport in China, you will need the original permit to board the flights. We will send the original permit to you by EMS or Air-Express which takes 1-3 days within China and we need your exact post address such as your hotel or residence address in China (including contact person, contact phone number and the correct name under which the hotel booking is made). If you take the train to Lhasa from Chongqing, Xi’an, Lanzhou, you also need the original permit to get the ticket and we will send it to you by EMS or Air-Express as well. We suggest you take the train ticket in advance to avoid any urgency or unexpected situation. If you take the train from any other city’s station to Lhasa, you only need to have the photocopy of the permit and we will email you the electronic copy to you in advance. The police in Golmud station will check the permit so you should keep it safe. However, our local tour guide will collect your TTB permit after your arrival and guide will need to hold it for your whole trip in Tibet and return all Tibet travel permits to our agency after the trip. To all foreign tourists who want to travel to Tibet, you must have a Tibet Tourism Bureau (TTB) Permit. You are not allowed to apply this by yourself, so we will help you get this. You need to send us clear scanned or photo copies of your valid passport date page and China Visa. No matter whether you hold “Z”, “F” or “Q” type China visa, or APEC visa, we can help you apply permits smoothly. We will need your specific schedule (including the entry and departure dates, means of transportation, cites you come from and leave for in China) to fill in the blanks on the permit, so we strongly suggest you arrange your travel schedule at least 15-30 days before the starting date of your trip in advance. As a professional Tibet travel agency, we can apply for the Tibet permit one month before the starting date to guarantee the whole process successful. This is another common questions by pilgrim travelers from India who hold Indian passports. Unfortunately China local gov here in Lhasa restricts any travel agencies to apply Tibet Kailash travel permits for Indian nationality travelers. So be careful that some agency website claim that they can arrange Kailash tours for Indian nationality travelers, this is fake and just for their website promotion. Especially there is famous Chinese travel agency who sells lots of group tours to Tibet and claiming they can arrange Kailash tours, hope you can avoid the hassles in advance. Since 2008 March 14th in Lhasa, it is regularly forbidden that foreign visitors come to travel in Tibet in every February and March. You should avoid these months and choose other time to travel to Tibet and normally from every April 5 foreigners begin to enter Lhasa (however try to postpone your trip around April 5 and it is generally no any problem). Like in April 2017, our Tibet travel agency arranged around 8 foreign groups entering Lhasa from April 2 to April 15, and the earliest arrival for Kailash tour is April 15, 2017. 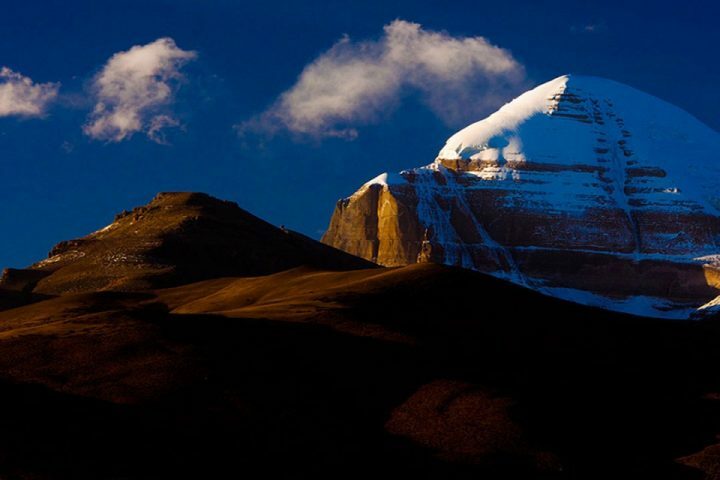 Normally Kailash travel permits application takes the longest time in Tibet permits process. We will keep it posted instantly under our Tibet travel permits FAQs pages. As many people mill more or less have Mountain Sickness, you should not run, leap or use your body heavily when you first come to Tibet because Mountain Sickness will not occur instantly when you arrive. It usually happen some time later. And you should stay hydrated because acclimatization is often accompanied by fluid loss. Avoid tobacco, alcohol and other depressant drugs. Prepare some AMS pills such as “Diamox” during the trip in case of strong symptoms. For more details about a comfortable Tibet tour, contact our local Tibet tour agency now. Tibet travel tips about the altitudes during Tibet travel. In Lhasa, the altitude is not very high, usually 3,658 meters (12,001 feet). The altitude is lower in Qamdo and Nyingchi for 3,202 meters (10,515 feet) and 3,000 meters (9,843 feet). On the way to the Everest Base Camp, the altitude will rise, it is 3,836 meters (12,585 feet) in Shigatse, 4,300 meters (14,108 feet) in Tingri, 4,040 meters (13,255 feet) in Gyantse and 5,380 meters (17,600 feet) in Everest Base Camp. Close to Mount. 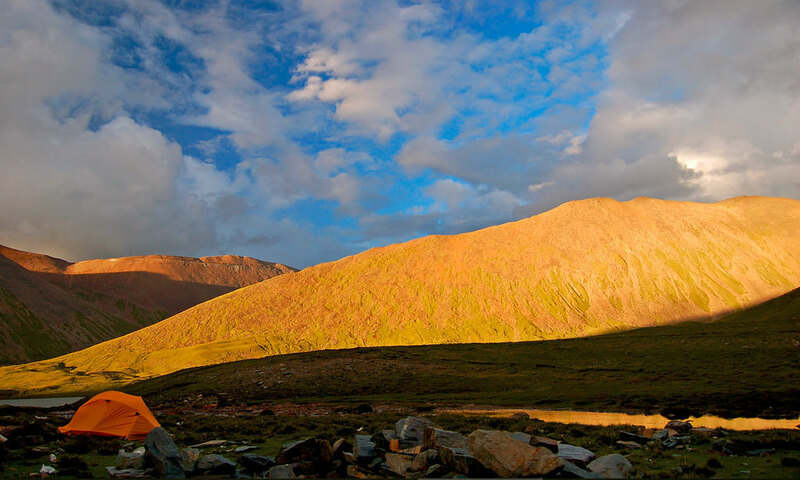 Kailash, in Darchen, the altitude is 4,575 meters (15,010 feet) but the altitude will rise at 5,210 meters (17,093 meters) in Dira-puk and 4,810 meters (15,781 feet) in Zutul-puk. In Dolma La, the altitude can be 5,570 meters (18,274). Normally we do not suggest you drink any alcohol in the first or second day tour in Tibet because you need time to adjust to the high altitude. But if your body feels good and you really want to taste it in the following days, you can have a little bit. The Tibet highland barley wine is a light wine, with a low spirit of 8%. As you know, to have a Tibet highland tour, it is not always easy and only when your health situation is quite good, you may try some light alcoholic staff. People begin to ask that “When is Tibet closed for foreign travelers in 2017?”, Well as usual, Tibet Travel Permit is applicable for all foreign travelers who entering into Tibet during Feb.20 to March 31, 2017.However for foreign travellers entering into Tibet before Feb.20 2017, they need to leave Tibet before Feb.25. And Tibet travel has been reopen on April 1, 2017. So far there is no official news of Tibet closure. Tibet closure every year is a common practice in Tibet since the March 14, 2008 issues in Lhasa. However ever year (except 2008), all foreign travelers (except for Norway People) can still in Tibet without any hassles if they book the trip with Reliable Tibet travel agency in Lhasa. We will keep updating the Tibet travel permits on our Tibet travel blog and news Chanel, as well as Tibet Travel FAQ pages. Updated on April 24, 2017: Do I have to find Malaysian travelling companions to travel Tibet? In my group, do we have to have the same nationality? Some travelers from Malaysia still ask this question. However since 2 years ago, the Tibet travel permits restriction on the same nationality is already cancelled. Now different foreign nationality travelers can travel together in Tibet. This is a favorable policy so far in Tibet tourism. We wish more and more travelers can travel together, sharing the group tour cost. 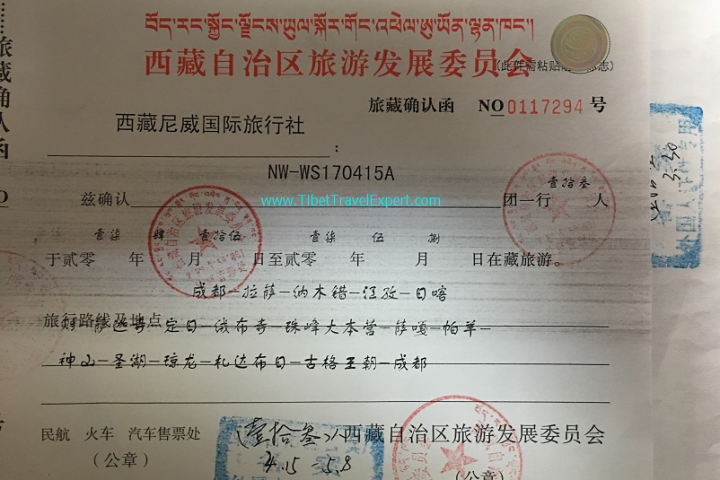 Tibet Alien's Travel permit,Where to apply? in Lhasa,Shigatse or Nyingchi? Tibet Alien’s travel permits are for foreign travelers to travel in the not fully open regions in Tibet. And these places refer to Tsetang (such as Samye Monastery, Mindrolin Monastery, etc), Mt. Everest Base Camp, Saga, Payang, Mt. Kailash, Lake Manasarovar, Guge Kingdom Ruins, and Lake Draksumtso in east Tibet (Nyingchi prefecture). We apply these permits in local “Public Security Bureau“, so that is why this permit has another name of “PSB permit”. If your travel includes Lake Draksumtso and if you leave Lhasa for this sightseeing and Nyingchi is your last stop, we will need to apply this permit in Lhasa. Foreign travelers are asking whether they can travel to Tibet in October 2017. Well the local tourism bureau had announced an unofficial notice to all travel agencies that foreign travelers can not travel in Tibet between Oct.18 and Oct.28 in 2017. This temporal closure of Tibet is due to the upcoming Beijing GOV meeting-the 19th national party congress meeting. So Tibet faces another sensitive travel time again. This is fairly normal during the sensitive political climate. Nobody can be sure whether there is more closure announcement or not. For a Tibet tour, please contact us for the latest situation, however to book any tour of Tibet, you need to book no later than 20 days before the actual arrival date. Foreign travelers who want to explore Tibet in 2018 begin to ask whether Tibet will be closed again in March or not. Many foreign travelers also want to visit Tibet in February and not sure whether they can or can not. Well as based in Lhasa, our Tibet travel agency apply the travel permits for foreign travelers in early February smoothly recently, but right moment there is no inner news so far about how soon Tibet will be closed again. Anyhow the March is annual sensitive time in Tibet and Seda Monastery region in Kham (Garze Sichuan province), it is very possible the permits will be restricted for travelling in March. So for foreign travelers who want to explore Tibet and want authentic Tibetan travel experiences, they can consider the destinations in Kham of Sichuan, Amdo in Qinghai. But before booking any tour, please contact with our agency for the latest information around Tibet. For Tibet travel, you would worry about Tibet mountain sickness. Acute Mountain Sickness (AMS) is an illness that affects people who climb mountains or travel above 2500 meters altitude. It often occurs when your body cannot adjust to a high level of altitude. Because most places in Tibet Autonomous Region (TAR) are higher than this level, Acute Mountain Sickness (AMS), also called Altitude Sickness is the biggest health risk to tourists in Tibet. AMS is common at high altitudes due to the decreasing availability of oxygen. Most people will experience differing degrees of symptoms at high elevation. The symptoms include headache, fatigue, loss of appetite, nausea, dizziness, shortness of breath, disturbed sleep and general feelings of malaise. 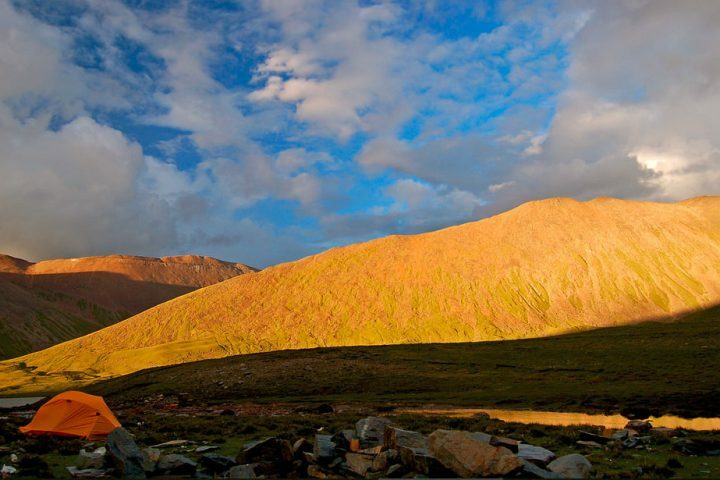 It is common for people to experience mild symptoms of Mountain Sickness when they come to Tibet at fist. You need one to two days to get used to the plateau condition. As your body gets used to the altitude, they symptoms will go away. You can try to do some exercise before you come to Tibet. Normally people will take some medicine like Hongjingtian 10 days in advance to avoid Mountain Sickness. And another common recommended medicine would be Diamox which many foreign travelers prescribe it before coming to Tibet. Definitely! We will carry oxygen cylinder for emergency issues. And local hospitals are ready to deal with any emergency cases. We will take good care of every customer during the tour. The rise of altitude is not immediate and it is a gradual process. So if you feel anything wrong, you can inform your Tibetan guide instantly and we may need to adjust the Tibet tour program and wait for you to feel better and take optional easier tour program accordingly. And if anyone feels very uncomfortable, we will let him stay in the relatively low altitude places and will catch him/her later when we finish the high altitude tour. When you fly from Lhasa to Kathmandu, Nepal, the airport custom will check passports, your China visa, Tibet permits (including entry permit and border defense permit), however guide will need to show these permits and help you clear the customs easily. After that, guide will take permits back. Hope this helps. Any reliable Tibet travel agencies here in Lhasa know very well. On one hand, you don’t have to keep your original TTB permit because you already have the photocopy in your mind. On the other hand, we need to return the permit to the Chinese government. So please understand our duties. You may want to ask whether you can take one agency’s Tibet travel permits to join different Tibet travel agency’s tour. Well the answer is absolutely no. On one hand, it is not legal per local provisions. On the other hand, even if you succeed by a fluke, it is not likely that you will have more pleasure with other agencies. We do not suggest this kind of action because all procedures need time and strict inspection. But if you have any urgent situation and have only one week to prepare for everything needed for the Tibetan trip, as a professional and well-experienced Tibet travel agency, we can help you with all the documents you need (Group Visa for entry from Kathmandu by flight, TTB Permit). But this can be only possible for city tours like visits to Lhasa (Lhasa, Namtso and Ganden etc short distance and fully open area), Lake Namtso, Lake Yamdrok, Gyantse and Shigatse. However, we cannot guarantee 100 percent although we will try our best. If it is unlucky, you do not have to pay us single dollar for this TOP urgent case. To be responsible, our tour guide will keep your Tibet travel permit safely during all your tours with us. We can give you the photocopy if you want but it is not necessary. If you want some free time in Lhasa, you can take the photocopy with you but we strongly suggest you join our many optional Tibet day tours packages because there are many local tour guides to share their knowledge and insights about Lhasa with you. Should you have any more questions on Tibet permits, please check our Tibet travel permits FAQs. How can I obtain Aliens’ Travel Permits (ATP) for my Tibet Travel? This is another common question about Tibet permits. Permits to visit places that are not declared open are known as Aliens’ Travel Permits (ATP). So if you want to travel to places besides Lhasa, Gyantse, Shigatse, you will need Aliens’ Travel Permits (ATP) issued by Local Public Security Bureau (PSB). A single permit (with a group’s all name list) is normally issued to all the people who are traveling together and the permit just name one of them and states how many others are accompanying him. After you arrive, we need your original passport and visa to apply for the permit in Lhasa or Shigatse and it normally takes only 30 minutes to get this. Our Tibetan tour guide will apply and keep the permit for you. 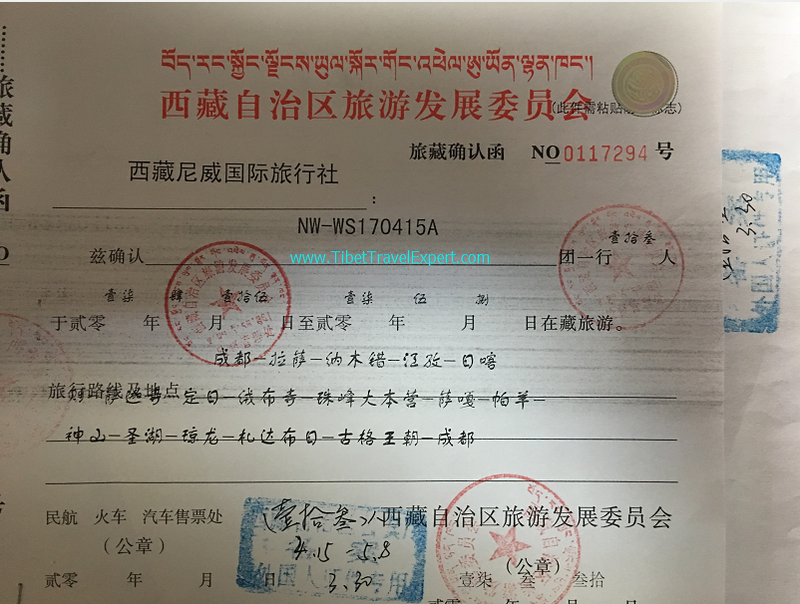 Military and Foreign Affairs Permit are documents for travels to some military sensitive areas such as Yunnan/Sichuan to Tibet overland and Mt. Kailash area. Our local Tibet travel agency begins to apply these permits normally 1 month in advance at least to avoid any urgent cases, because to apply these documents for long distance trip such as to Kailash or Sichuan/Yunnan to Tibet, we’d better confirm and begin different application process earlier to ensure the trip works smoothly and it is why normally these travelers fix their Tibet tour booking with us 1 month to half year in advance. What is the latest Tibet travel permits information update so far in April 2017? Well, the answer to this question is that: all Tibet permits application process is faster than usual. Nowadays we have obtained many permits for entry date by end of May and permits for June 2017 are also applicable now. However the overland trip from Chengdu to Lhasa is not workable and no agency can apply permits for Sichuan-Tibet overland tour so far. Moreover, from later last year, the Chinese Embassy in Kathmandu, Nepal has announced a new restriction for the Tibet Group Visa for 26 different nationalities as listed here:1. Pakistan, 2. Bangladesh, 3. Sri Lanka, 4. Afghanistan, 5. Azerbaijan, 6.Lebanon, 7. Syria, 8. Iraq, 9. Iran, 10. Kazakhstan, 11. Kyrgyzstan, 12. Tajikistan, 13. Turkey, 14. Uzbekistan, 15. Albania, 16.Democratic Republic of Congo, 17. Ghana, 18. Cameroon, 19. Kenya, 20. Libya, 21. Mali, 22. South Sudan, 23. Nigeria, 24. Somalia, 25. Tunisia, 26. Chad. So, all these 26 nationalities travelers should obtain the Chinese visa from the Chinese Embassy in their home country. Why Can't I mention Tibet Travel when applying China Visa? Tibet is a politically sensitive region and movement of foreigners in Tibet is highly monitored (thus all the permit paperwork and mandatory guided tour, etc). If Tibet is one of the destinations during a trip to China, there is high possibility that the embassy/consulate will put more scrutiny on your visa application by requiring additional paperwork, which extends and complicates the application process. To bypass the potential complication, you can simply just provide the flights to and from China, there is no need to provide all the other domestic flights details. The embassy/consular will only see that you enter China from cities such as Beijing or Shanghai and leave China from Beijing, or Shanghai, etc, and they will not probe your actual itinerary within China. Should you have any further questions, read more on Tibet Travel Permits and Visa.